Click for trip photos and an overview map. It was a rare opportunity: snow was falling in Corvallis, Oregon. I had to get out and explore. On Thursday, the snow began coming down. I drove to my morning appointment as usual, and there was only about an inch of white stuff on the ground. Later, several more inches fell, and I switched to walking to get around town. Not trusting the drivers on the road, I felt much safer. It was pretty, but people were less excited about the weather since we’d just gone through this in December. I, on the other hand, was overjoyed, especially since the next day’s forecast called for much more snow. Now certainly I’m no stranger to snow, and the snowfall amounts were nothing extraordinary…for New England. But here in the Willamette Valley, snow accumulation was something of an oddity. We’d had another surprise snowstorm just a couple months earlier that shut down schools and created icy roads for nearly a week. But typical years will see only a dusting of snow, if that, and then it’s back to business as usual. 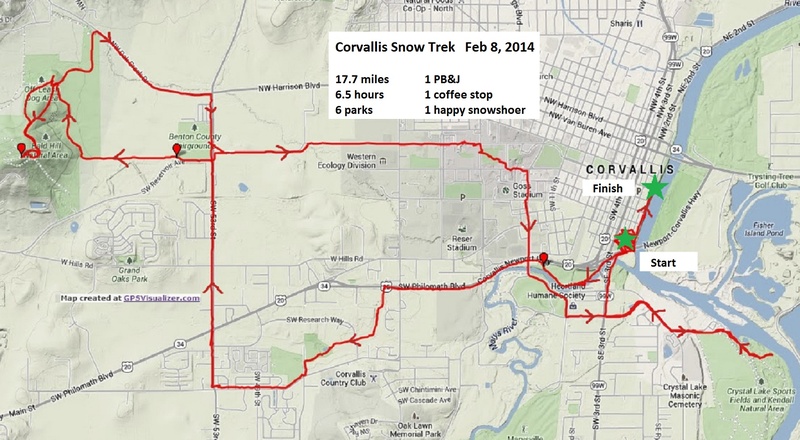 I arose early on Friday with a plan: I’d snowshoe around Corvallis, linking up several parks by foot, aiming for a minimum of 14 miles before ending up back where I began, on the waterfront in downtown. My trek began at the free parking lot at the south end of downtown Corvallis. 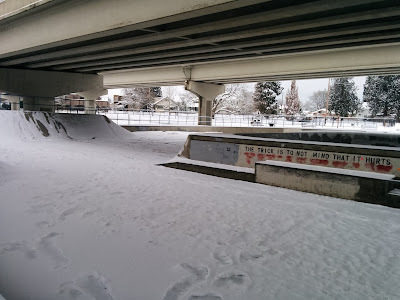 From here, I headed straight for the bike path that took me briefly along the Willamette River, then past the skate park and along Marys River. I followed the bike path as it paralleled highway 20, watching the occasional car carefully drive by. Then the path dipped south and west away from the main road, through pockets of forests and manicured parks. Here, I encountered a jogger, a skier, and little else. As I passed through Starker Arts Park, I noticed a man in the pavilion across the pond. It looked like he was doing the moonwalk in combination with an entire dance routine that he was totally into. Strangely compelling, it was hard to stop staring and walk away. The weather inspires all of us just a little bit differently. Past the parks and back on the main road, I approached my first stop: Imagine Coffee. It was packed with people, and the baristas were doing all they could to keep up with the orders. I wolfed down a scone while waiting for my coffee, knowing I’d need all the calories I could pack in today. The next stop on my agenda was Bald Hill. It was a long, straight road walk north to reach the park. I truly appreciated my snowshoes here, as the snow was less well packed down than in places closer to downtown. 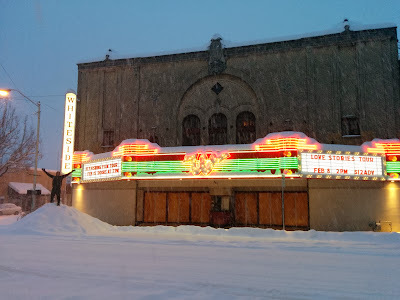 I cruised along, admiring the snow-covered landscape and feeling cozy in my smartwool top and fleecy pants (usually reserved for out-of-town adventures). At the fairgrounds I turned right and picked up the Midge Cramer Path. I started seeing more cross-country skiers and a couple of snowshoers out and about. This path led me right into Bald Hill Natural Area, where I’d pick up my high-point of the day. On my way to the top, I passed just one skier on his way down. Most people, it appeared, were sticking to the level trails. I enjoyed the solitude, and was happy to share my space with flocks of thrushes flitting about in the trees. The snow was still falling steadily at the top of Bald Hill, obscuring any views. I trod back down and detoured into the big, barn-like shelter at its base. Shielded from the falling snow, I took off my backpack, made some Del’s frozen snow-lemonade and ate my lunch. Soon after, a herd of college kids with snowboards on their back headed up to make a couple of runs off the back side of the hill at the shelter. I couldn’t believe how cold I was getting just standing around for that 30 minutes. As it turned out, I’d been working pretty hard to shuffle through the snow. With frozen hands I packed up and headed back down to the flat path leading to the Oak Creek entrance of the park. Just before reaching the parking lot, I herd some puffing and whinnying. I looked up to see a woman on a horse, getting ready to pull a sled with one passenger behind. I stopped to grab my camera, and before I looked back up the horse began galloping full speed ahead along the trail. It blazed by me, sled passenger screaming with joy, then came to a complete stop and sauntered back. Another man anxiously waited his turn to go for a ride. The whole scenario was hilarious. I left the park and walked down Oak Creek Road towards campus. This was a long, relaxing stretch through rural farmland. Huge rows of oak trees stood grandiose over flat, snowy fields. I efficiently re-warmed my body by putting in fresh tracks in untouched snow along the roadside. Once back at 53rd street, I turned south to pick up the campus way bike path. The bike path turned out to be a popular destination for the afternoon. Plenty of cheery, rosy faces passed me by as I blazed east to get back to civilized Corvallis. I chuckled as I passed the snow-topped solar panel farm. All the animals that were usually out grazing in the fields must have been taken inside; there were no cows, llamas or sheep dotting the countryside as usual. Oregon State University had been closed for two days, so campus was unusually quiet. Certain sidewalks were clearer than others, so the snowshoes came in handy once again. I cut diagonally across campus to get to 15th street, which would take me into South Town. Crossing Marys River on the 15th St bridge was beautiful. 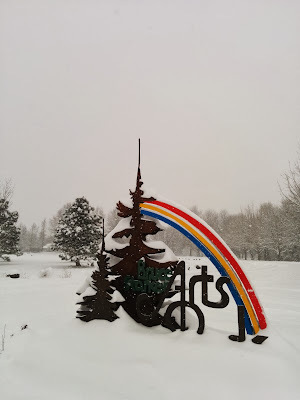 I’d hoped to go next into Avery Park to take photos of the dinosaur bones and train covered in glittery snow. But the park was packed with people of all ages walking up one of the few hills in town and sledding down. It felt rather un-photogenic and I was starting to feel all the miles behind me, so I just kept walking. The last park on my list was Willamette Park, where I hoped to find excellent views of the river and trees. To get there, I had to walk along Crystal Lake Drive. Clearly the people of south town were not getting out as much as folks throughout the rest of the city, since the sidewalks were totally snowed in. With heavy legs I pushed through deep snow all the way to the park. Here, the parking lot was buzzing with vehicles. Not a good sign. The park was full of people walking or skiing with their dogs, and apparently they hadn’t thought to walk to the park, just in the park. I’d pretty much decided then that I wouldn’t traverse the length of the part, since I knew my patience with hordes of dogs was pretty low. But, I’m really glad I made it there, or I would have missed this: a man in a wooden canoe on the river’s edge, playing a harmonica. It was so pretty and funny and awesome all at the same time. I regret that I didn’t wander down for a photo and a chat. I’ll blame it on the tiredness. I took a side path from the main drag just to get away from all the people, and found myself at a dead end with a thicket of gnarled shrubs surrounding me. Here, I turned around for the final push to downtown. The snow, which was falling consistently all day, was still coming down. Visions of beer and food began infiltrating my thoughts. I knew it was time to bring it in. I was happy to go back the way I came, through the snow I’d already compacted. I retraced my steps back up Crystal Lake drive and then turned right along 99E. The sidewalk would connect to the bike path leading into downtown. The contrast of the snow, trees, and rivers with the built elements of the city were stunning. Once I reached the waterfront, I was singly focused on reaching Cloud & Kelly’s Pub for happy hour. It felt amazing to take off my snowshoes and wet gloves to sit down and polish off a bowl of mac and cheese with a pint of porter. 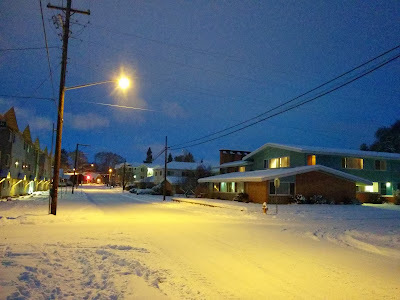 Here I gave my body a bit of a rest before casually walking back home during the early evening hour, watching as the dimming light brought out new colors and contrast in the buildings and snow sculptures throughout town. It was a rare opportunity to see much of Corvallis by foot in these peculiar weather conditions. I just hope I don’t have to do it again soon. This entry was posted in Hiking, Oregon and tagged hike366 on February 9, 2014 by Jess B.